The A-7 enjoyed the fastest and most trouble free development period of any American combat aircraft since World War II. The YA-7A made its first flight on 27 September 1965, and began to enter Navy squadron service late in 1966. The first Navy A-7 squadrons reached operational status on 1 February 1967, and began combat operations over Vietnam in December of that year. 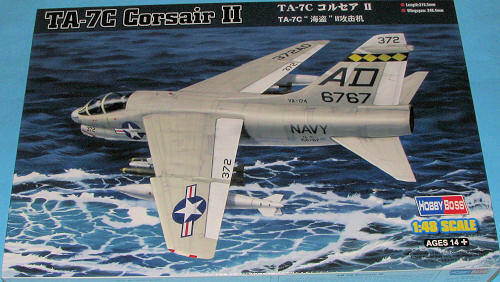 The A-7A and subject of this kit was the first production version. Early USN Corsair IIs had two 20 mm Colt Mk 12 cannons with 250 rounds per gun. Maximum ordnance, carried primarily on the wing pylons, was theoretically 15,000 lb (6,804 kg), but was limited by maximum takeoff weight, so the full weapon load could only be carried with greatly reduced internal fuel; 199 built. Many were later refurbished for Portugal and sold as A-7Ps. New build A-7H airframes were supplied to Greece while Thailand got refurbished A-7Es as the types only export customers. The TA-7C was a two-seat trainer version for U.S. Navy, 24 converted from A-7B, 36 from A-7C. In 1984, 49 airframes, including the 8 EA-7Ls, were re-engined with the TF41-A-402 and upgraded to A-7E standard, though still maintaining the TA-7C designation. Like the other A-7 versions produced, the kit is nicely molded in the current style of lots of indented rivets. I found just a few sink areas on the outside of gear doors where there is a lot of internal detail. The kit has a well done cockpit with raised instrument details on the main panel and side consoles. Decals are also provided in case you wish to go that route. The seats are a bit plain looking and like most kits, could do with a more detailed replacement, or at least a harness. The wheel wells are fully detailed and the intake goes back to the end of the cockpit area. Also detailed are the external avionics bays with covers that can be posed open. Now in the USAF, it was common to see some of these open, but not in the Navy where the salt air environment made this a foolish thing to do. Still, that option is there if you want to make yours land based. Full weapons pylons and a broad array of things to carry under the wings are provided. In fact, two sprues are nothing more than weapons. You get Sidewinders, Mk 80 series slick bombs with MERS, a pair of fuel tanks (which were frequently carried despite the Corsair II's excellent range without them), some more modern LGBs, and a FLIR pod. There are other guided munitions that you can relegate to the spares box. The kit includes a load-out sheet which shows the fuel tanks being carried on the outer pylons. From what I understand, only the inner pylons were plumbed for the drop tanks. At least, that is where I've always seen them carried. Now you would think that with an all new fuselage, this would be the opportunity to fix the two biggest defects of this kit. One is the oval shaped intake and the other is the canopy that is too flat on the top. Nope. Same problems. I just don't get it as these could have been so easily fixed. Aside from the canopy and new fuselage/interior sprue, the rest are the same as with the A-7A kit. 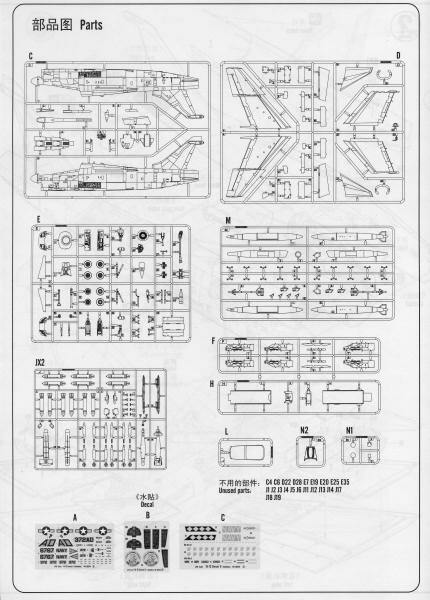 The new sprue also has bits for the A-7K on it so we know what we will see being released next. Instructions are quite well done. 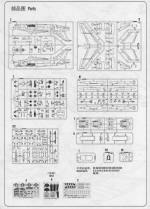 There is an nice parts diagram with a listing of unused pieces. Paints shown are the usual Gunze references with generic names included. The insides of the equipment bays are listed as Interior Green. most photos I've seen are Chromate Yellow, but I have seen one or two USAF planes with these areas in Interior Green. Markings are for two aircraft. One is a plane from the East Coast training squadron, VA-174. This one is in the light gull grey and white scheme. The other is a real poser. It is a Blue Angels blue plane with yellow trim with a Naval Air Reserve Center sticker on the fin. This plane never flew in these markings and in fact, is or was a display plane at a Reserve base. Why on earth Hobby Boss chose this scheme when there are a number of other valid schemes around is beyond me, but there you have it. All the yellow parts will need to be painted. The decals are well printed and should provide no problems with application. installation. 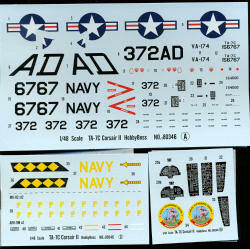 This one looks as if it will be as nice a build as the previous A-7 releases in 1/48.